Education Secretary Betsy DeVos stumbled through a series of high-profile television interviews recently, in which she appeared unable to explain or defend several of her department’s key policies. DeVos conceded that she has never “intentionally visited” underperforming schools in her home state of Michigan, where she spent decades promoting school privatization. And she struggled to clarify the administration’s position on how to improve school safety in the wake of the mass shooting at a Parkland, Florida high school last month. Education Secretary Betsy DeVos stumbled through a series of high-profile television interviews, in which she appeared unable to explain or defend several of her department’s key policies and admitted that she has never “intentionally visited” the underperforming public schools of which she has been so critical. One of the most controversial members of President Donald Trump’s cabinet, DeVos has long been an aggressive advocate for school choice, particularly in her home state of Michigan, where she’s poured significant funds into the effort to redirect government funding from public schools to private and charter schools, the majority of which are Christian. In perhaps the most ridiculed segment of her Sunday evening “60 Minutes” interview, DeVos admitted that she does not “intentionally” visit underperforming schools, and said she didn’t know if the school choice movement in Michigan has improved school performance, despite clear evidence that the schools have declined in recent years. “Have you seen the really bad schools? Maybe try to figure out what they’re doing?” CBS News correspondent Lesley Stahl asked. “I have not – I have not – I have not intentionally visited schools that are underperforming,” DeVos replied. “Maybe I should. Yes,” DeVos conceded. Critics of school choice say it hurts students left in the underfunded public schools and effectively privatizes what should be a public service. DeVos struggled to clarify the administration’s position on how to improve school safety in the wake of the mass shooting at a Parkland, Florida high school last month. The secretary, who has been tapped to lead a new commission on school safety, attempted to avoid questions about gun regulation and argued that states should make their own decisions about whether to arm teachers. When “Today” show host Savannah Guthrie asked her several questions about what arming teachers would look like, DeVos had few answers. 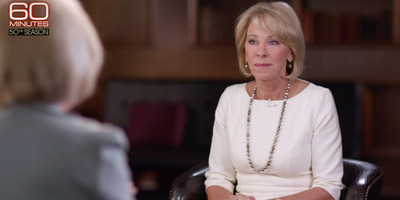 She repeated vague statements assuring her commitment to “advanc[ing] ways in which schools can be made safer for students,” as she told Fox News hosts during another interview on Monday morning, and said “everything is on the table” in terms of policy proposals. In her “60 Minutes” interview, DeVos touted her efforts to roll back federal government “overreach,” specifically regulations that allow transgender students to use the bathroom of their choice, that aim to protect students from racially discriminatory discipline, and that provide more protections to victims of sexual assault on college campuses. Under DeVos, the department is championing a change to Title IX that would provide more protections for students accused of sexual assault. DeVos said she does not know if there are as many incidents of sexual assault as there are incidents of false accusations on college campuses, a bizarre and controversial opinion given the numerous studies that have found that about 20% of female college students are victims of sexual assault. DeVos’s interviews were met with scathing criticism from reporters and education experts, some of whom argued that she is unqualified for her powerful position. BuzzFeed editor-in-chief Ben Smith argued that the billionaire GOP benefactor was appointed for her connections to the party and her financial support of Trump rather than for her education chops. “This offers a kind of sad glimpse at the way some huge philanthropic and political donors go through life: being told they are geniuses by very accomplished people who want their $; and then totally unready for actual challenge,” Smith tweeted.